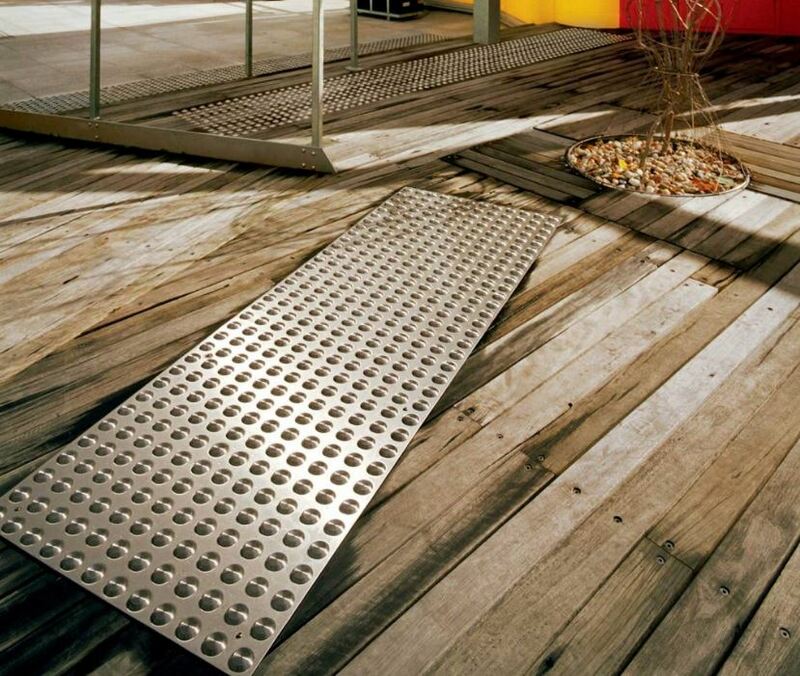 Tactile Ground Surface Indicators (TGSIs) are a collection of raised dots and bars that are installed on pedestrian surfaces to aid the orientation of people who are vision impaired or blind. For vision impaired pedestrians, tactile indicators provide greater access to the urban landscape, with increased potential for unassisted mobility. 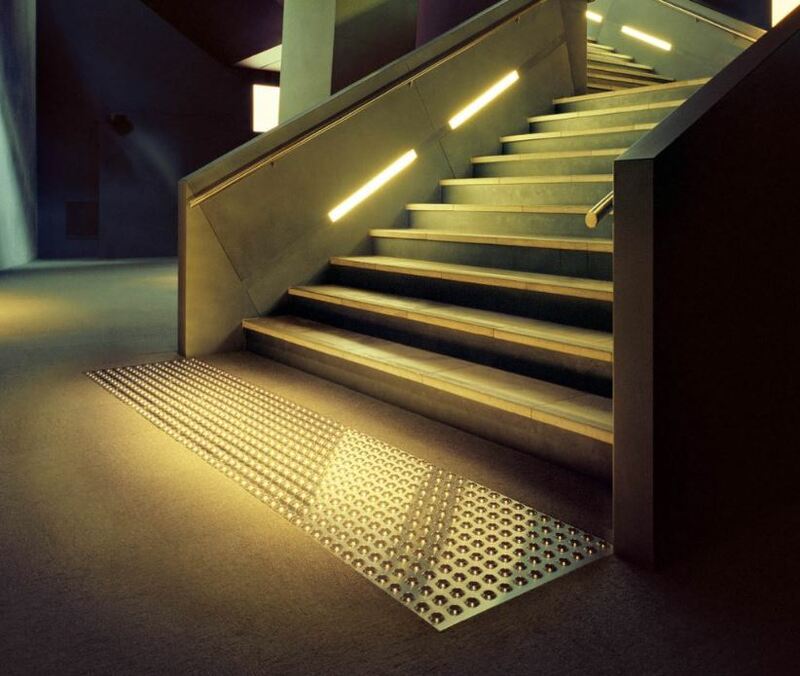 Tactile indicators can be detected by cane, felt underfoot, or even interpreted as a light contrast between a surface and a hazard, allowing the built environment to be negotiated safely. Extensive testing for slip resistance and luminance contrast has been conducted by independent bodies, which ensures peace of mind when selecting DTAC ground surface indicators. 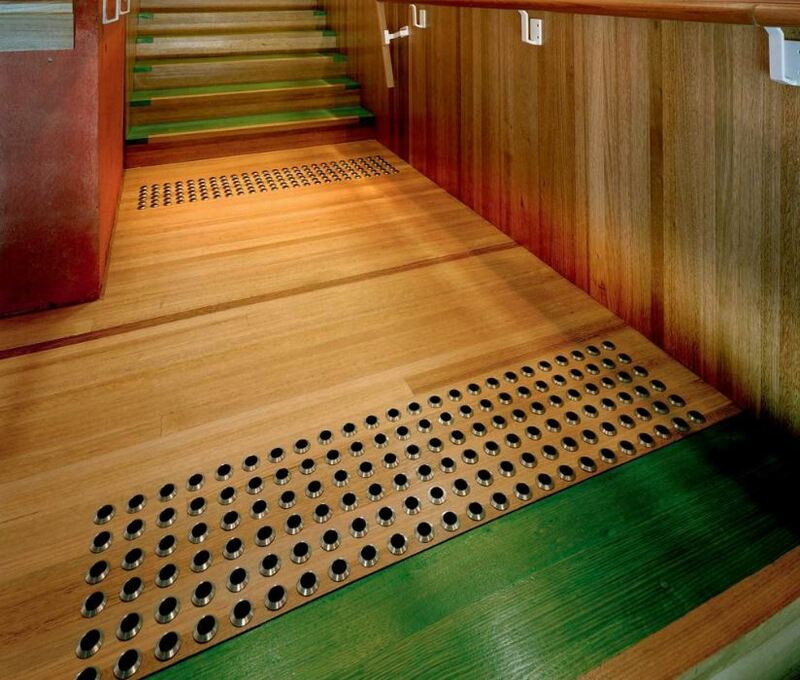 In Australia, standards are enforced to ensure clear interpretation of tactiles in all public spaces, thus ensuring that the experience of the vision impaired pedestrian remains consistent and non-discriminatory in the urban environment. Warning tactiles, sometimes referred to as hazard tactiles, are intended to function like a stop sign. 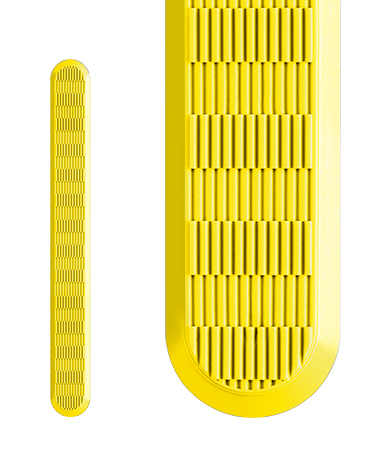 The raised dots provide a textural change to provide warning. Directional tactiles, sometimes referred to as leading tactiles, lead pedestrians along an intended obstacle free pathway, often terminating at an array of warning tactiles. DTAC tactiles are available in a range of colours and designs to suit all applications, with solutions suitable for all surfaces and substrates. 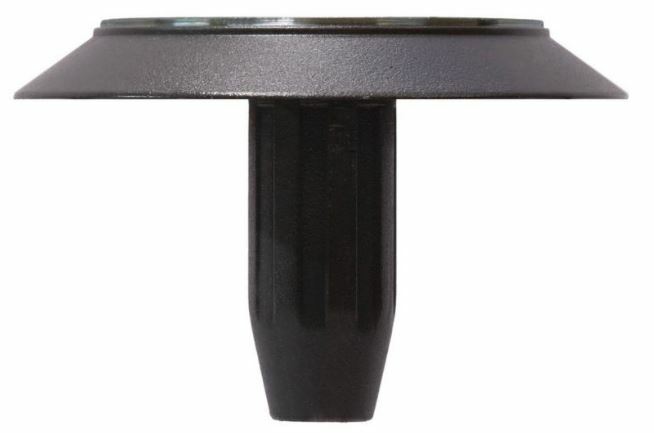 DTAC tactile indicators are designed to comply with building codes and regulations. They are also tested in accordance with luminance and slip resistance standards. DTAC products are built for the job! TGSIs need to withstand very harsh conditions and are constantly exposed to heavy foot traffic, rolling loads & extreme weather conditions. Inferior products will degrade quickly. DTAC TGSIs are easy to install and are regularly applied in and around stairs, ramps, landings, escalators, travelators, pedestrian crossings, waiting platforms, shopping centres, libraries, commercial buildings, offices, industrial areas, theatres and arenas. DTAC tactiles are quality, reliable products that are backed by a two year warranty. DTAC and ABS West product specialists are experts at interpreting and applying the relevant standards / codes applicable to individual projects. Warning tactiles, sometimes referred to as hazard tactiles, are intended to function like a stop sign. The raised dots provide a textural change, indicating that the blind or vision impaired pedestrian should stop to determine the nature of the hazard in their line of travel. The warning tactiles come in a range of materials including stainless steel, brass and urethane. They combine performance and style with high slip resistance, while meeting Australia tactile compliance standards. 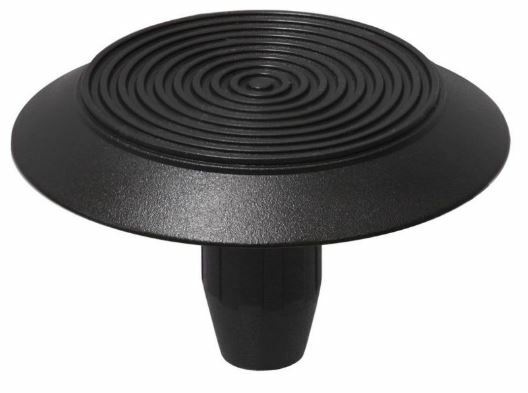 Warning tactiles are also available as hand rail buttons, designed for installation in situations where Tactile Ground Surface Indicators are not required. 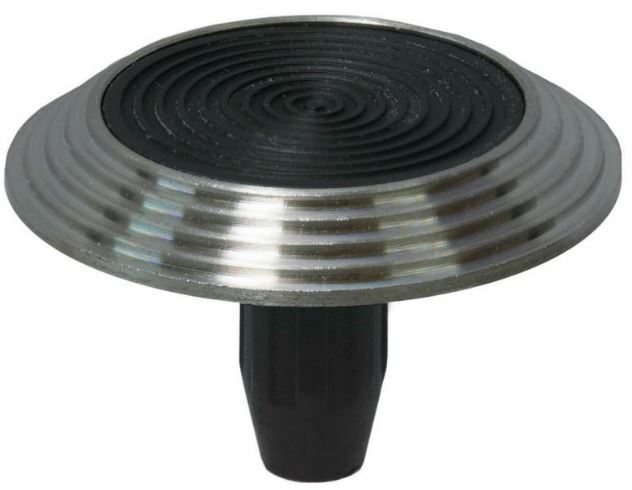 The hand rail buttons are commonly required for hospitals and aged care facilities. 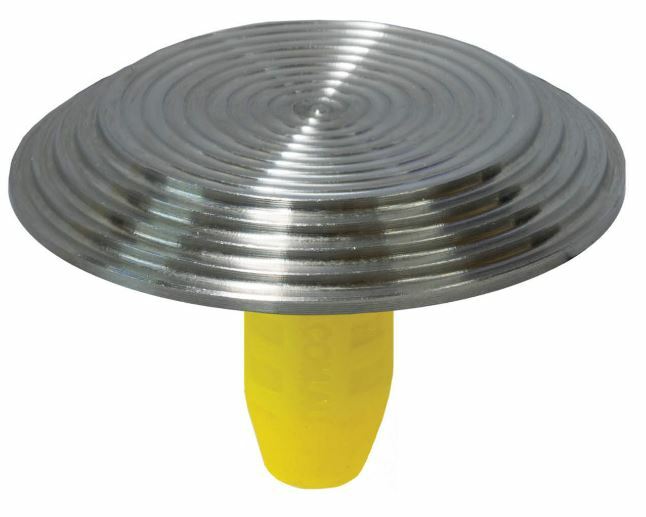 ABS West supplies warning indicators in the form of individual tactiles or as integrated tactiles. 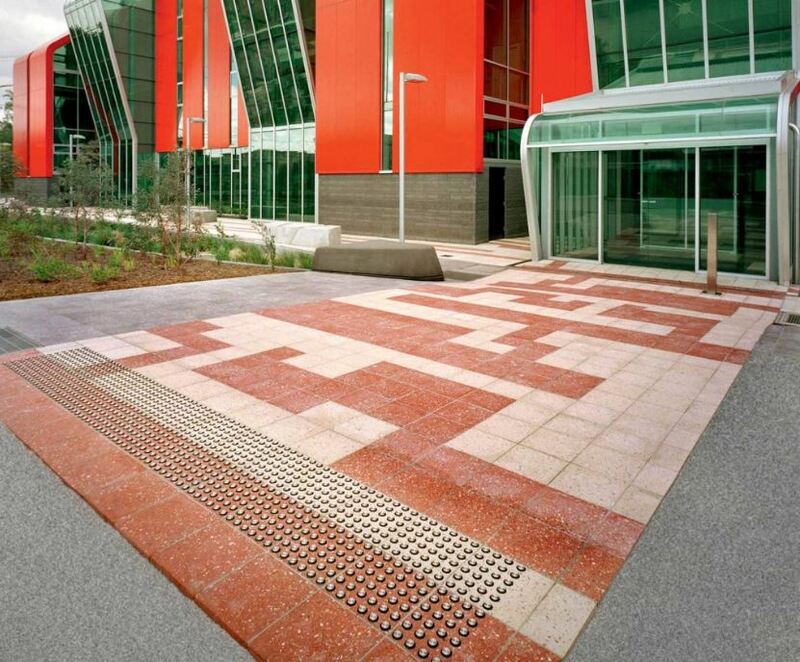 Combine wide aesthetic appeal with high slip resistance properties. Manufactured in 316 Marine Grade Stainless Steel, the DTAC STAINLESS CLASSIC TGSI features a machined, concentric circle design on the horizontal face with a smooth bevelled edge around its perimeter. Provide options to compliance when Heritage style architecture dictates the use of materials and finishes. Manufactured in Solid Brass, the DTAC BRASS CLASSIC TGSI features a machined, concentric circle design on the horizontal face with a smooth bevelled edge around its perimeter. Manufactured in 316 Marine Grade Stainless Steel incorporating a moulded polymer insert. The DTAC STAINLESS CLASSIC BLACK TOP TGSI features a moulded concentric circle design on the horizontal face and a smooth machined outer edge. Combine the flexibility of colour with durable urethane while ensuring high slip resistance properties. Moulded in Virgin and Re-claimed High Impact UV Stabilised Urethane featuring a moulded concentric circle design on the horizontal face and a smooth moulded outer edge. Combine the flexibility of colour with durable urethanes while ensuring high slip resistance properties. Combine wide aesthetic appeal with high slip resistance properties. Manufactured in 316 Marine Grade Stainless Steel, the DTAC STAINLESS CLASSIC INTEGRATED TGSI features a machined, concentric circle design on the horizontal face with a smooth bevelled edge around its perimeter. Combine wide aesthetic appeal with high slip resistance properties. Manufactured in 316 Marine Grade Stainless Steel incorporating a moulded polymer insert. The DTAC STAINLESS CLASSIC BLACK TOP INTEGRATED TGSI features a moulded concentric circle design on the horizontal face and a smooth machined outer edge. 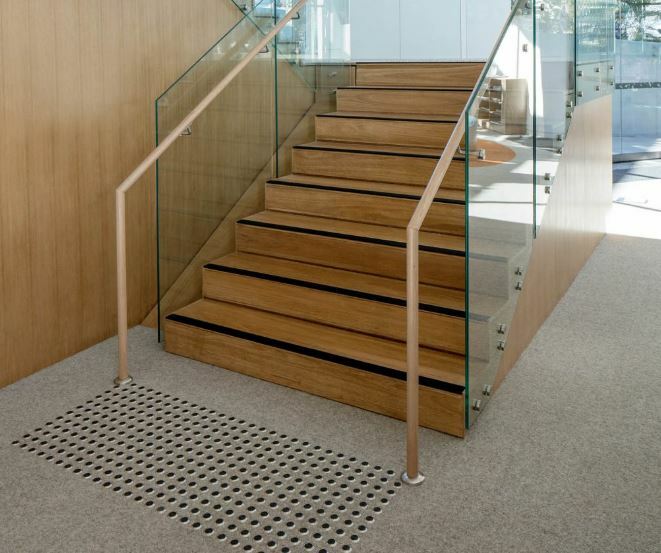 Exemplify the qualities of slip resistance while fusing together performance and style. 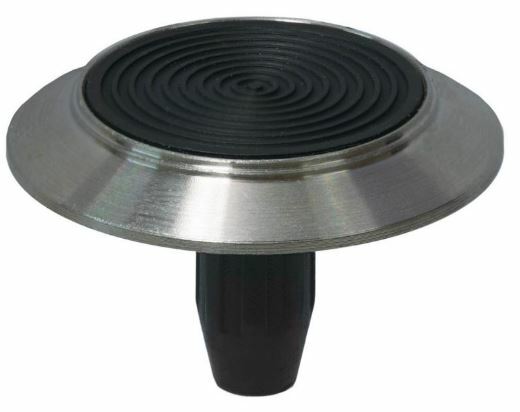 Manufactured in 316 Marine Grade Stainless Steel, the DTAC STAINLESS TERRACED TGSI features a machined, concentric circle design over the entire surface to provide maximum grip in all environmental conditions. 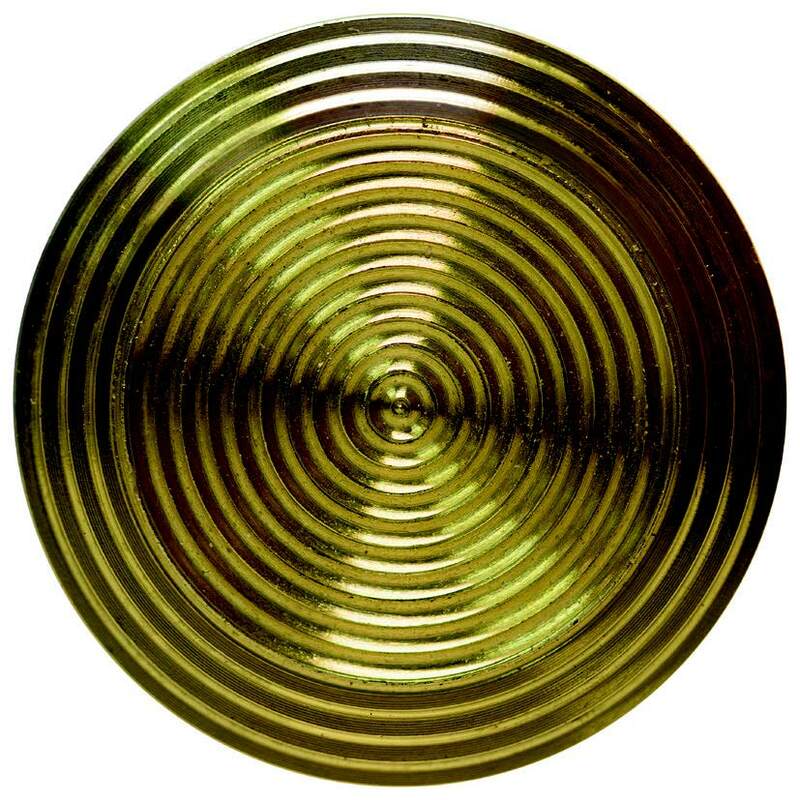 Manufactured in Solid Brass, the BRASS TERRACED TGSI features a machined, concentric circle design over the entire surface of the TGSI to provide maximum grip in all environmental conditions. 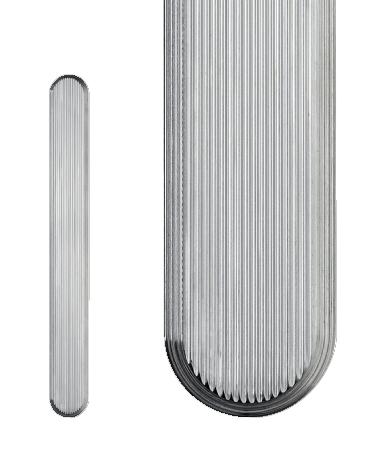 Manufactured in 316 Marine Grade Stainless Steel incorporating a moulded polymer insert. The STAINLESS TERRACED BLACK TOP TGSI features a moulded concentric circle design on the horizontal face and a terraced machined outer edge. Combine the flexibility of colour with durable polymers while ensuring high slip resistance properties. Manufactured in 316 Marine Grade Stainless Steel with a hardwearing outer Polymer Ring, the DTAC COLOURMAX TGSI features a machined, concentric circle design on the horizontal face with a smooth moulded outer edge. Combine the flexibility of colour with durable polymers while ensuring high slip resistance properties. Manufactured in 316 Marine Grade Stainless Steel with a hardwearing outer Polymer Ring, the DTAC COLOURMAX TGSI features a machined, concentric circle design on the horizontal face with a smooth moulded outer edge. An environmentally friendly alternative to the DTAC STAINLESS CLASSIC TGSI, featuring a cupped underside that uses less 316 Marine Grade Stainless Steel putting less demand on resources. 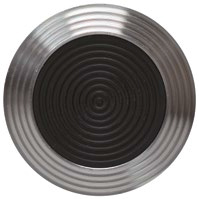 Features a machined, concentric circle design on the horizontal face with a smooth bevelled edge around its perimeter. Identical to the DTAC STAINLESS CLASSIC TGSI when installed. An environmentally friendly alternative to the DTAC STAINLESS TERRACED TGSI, featuring a cupped underside that uses less 316 Marine Grade Stainless Steel putting less demand on resources. Features a machined, concentric circle design on the horizontal face with a terraced slip resistant outer edge. Identical to the DTAC STAINLESS TERRACED TGSI when installed. 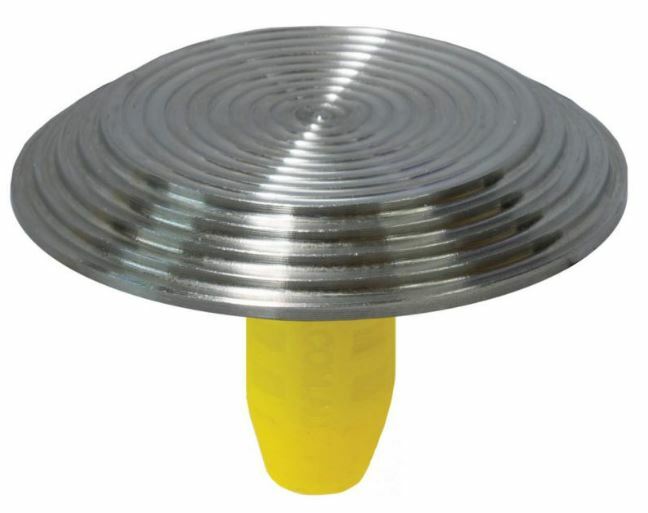 Hand Rail Buttons or Handrail Tactile Indicators (HRTIs), are designed to be installed in situations where Tactile Ground Surface Indictors (TGSIs), are not required. Applications for HRTIs are commonly confined to Hospitals and Aged Care facilities where visually impaired persons’ orientation will be assisted by an aid. HRTIs give important tactile information on Handrails that should be installed on both the up and down sides of stairs, ramps, corridors, passageways, etc. Manufactured in UV stabilised thermo plastic urethane (TPU), the DTAC Ultimat Warning Tactile features an injection moulded, concentric circle design on the horizontal face with a smooth outer edge. DTAC Ultimat Warning Tactiles combine wide aesthetic appeal with high slip resistance properties. 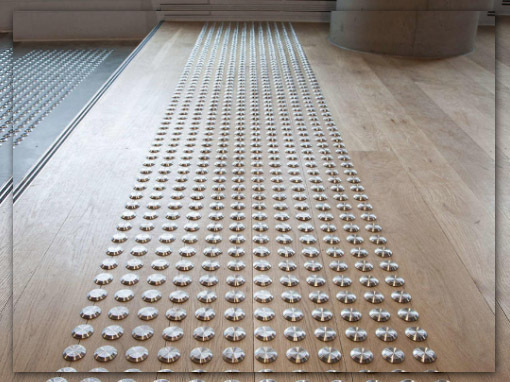 Directional tactiles, sometimes referred to as leading tactiles, lead pedestrians along an intended obstacle free pathway, often terminating at an array of warning tactiles. 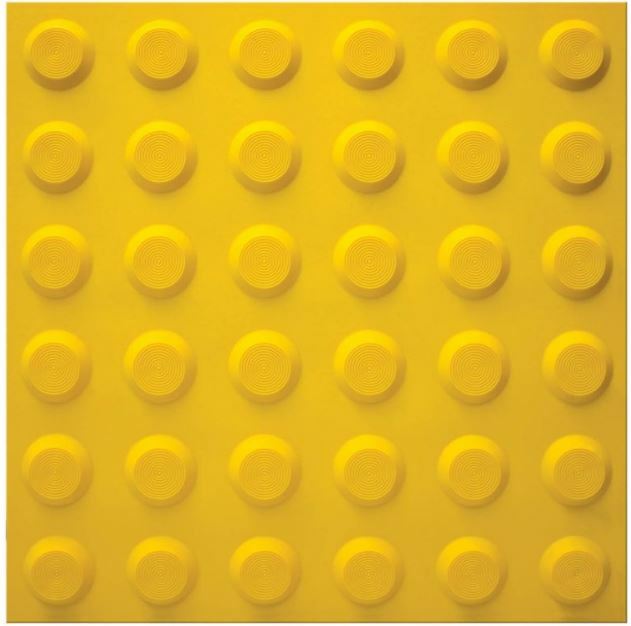 Directional tactiles are oriented in line with the prescribed direction of travel, and are commonly used at public transport access points and public facilities. 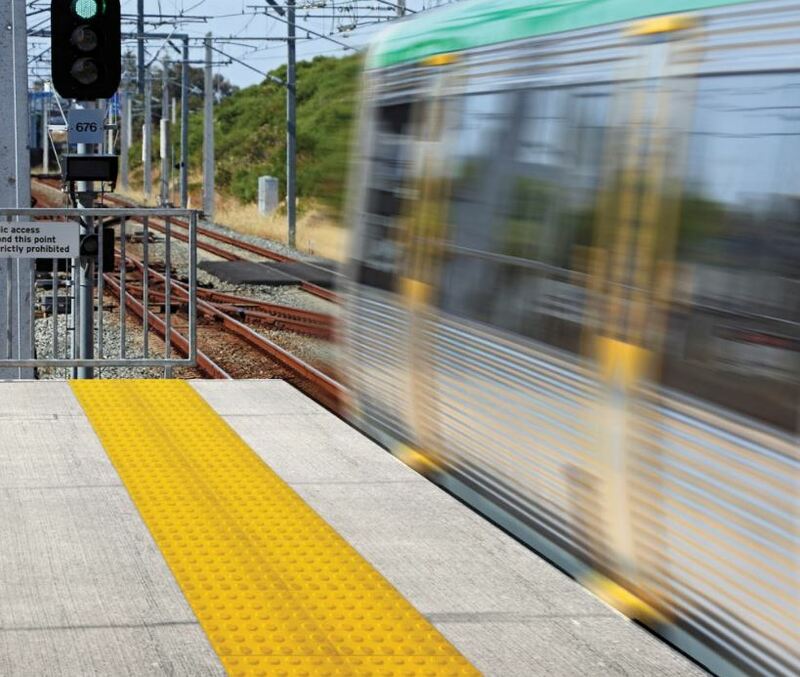 DTAC tactiles combine performance and style with high slip resistance, while meeting Australian tactile compliance standards. 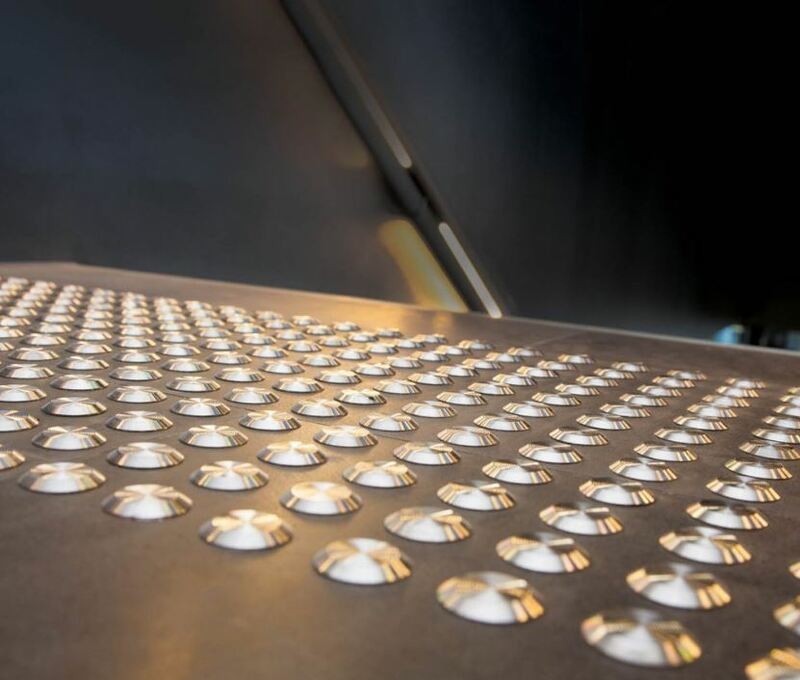 An environmentally friendly alternative to the solid classic directional tactile, featuring a cupped underside that uses less stainless steel, thereby placing less demand on resources. Features a machined, concentric circle design on the horizontal face with a smooth bevelled edge around its perimeter. Combines wide aesthetic appeal with high slip resistance properties. Features a machined, concentric circle design on the horizontal face with a terraced slip resistant outer edge. Combines wide aesthetic appeal with high slip resistance properties. Moulded in High Impact UV Stabilised Urethane featuring a grooved design on the horizontal face with a smooth moulded outer edge. Moulded in High Impact UV Urethane featuring a grooved design on the horizontal face with a smooth moulded outer edge. Where & Why are Tactiles installed? 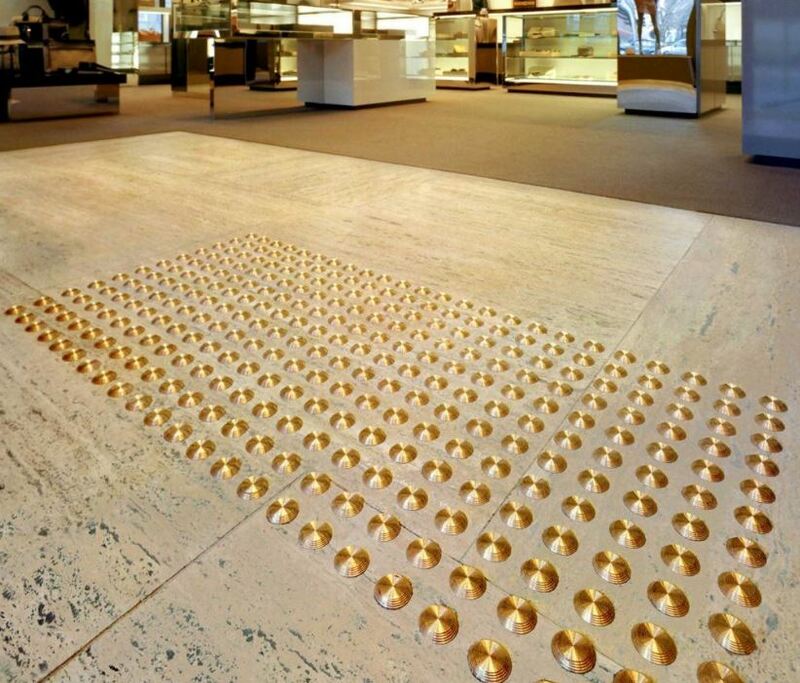 Tactile Ground Surface Indicators (TGSIs) are installed throughout external and internal public environments. They are installed at hazard points or locations where directional guidance is necessary for blind or vision impaired pedestrians. 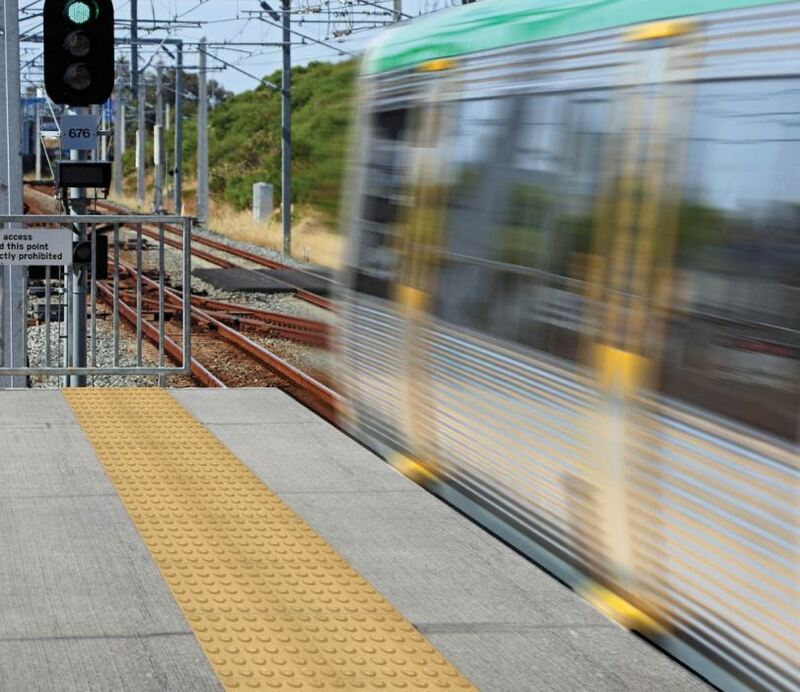 Hazard points include the top and bottom of stairs, ramps, waiting platforms, pedestrian crossings, escalators and any other area deemed to be a potential hazard. Also, it’s necessary to install directional tactiles where pedestrians need to be led in a prescribed line of travel. This includes areas such as street crossings and transport access points. 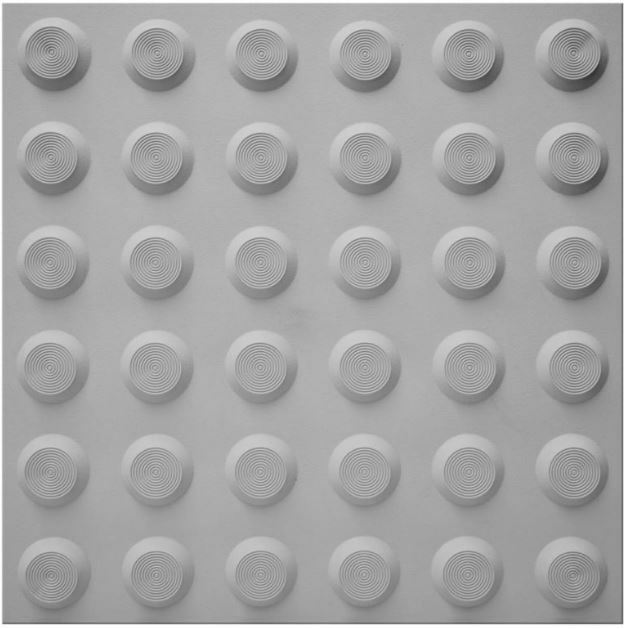 Are there Requirements Governing the Placement of Tactiles? Yes, tactiles need to be installed according to Australian Standards. Why? To maintain consistency so that blind or vision impaired pedestrians can interpret cues provided by tactiles. Inconsistency leads to misinterpretation and confusion. Why is it Important to Choose the Right Installer? The installer needs to have full knowledge of compliance requirements and be able to install according to these set standards. Locations and substrates vary, and so do the appropriate installation methods. The right installer will understand these variables and carry out the installation accordingly. What are DTAC Tactile Indicators Made of? Which Substrates can DTAC Tactiles be Applied to? Why do Tactiles come in Different Colours? Tactiles are available in different colours due to the fact that a large percentage of vision impaired pedestrians retain some sight. Luminance contrast plays a role in assisting blind and vision impaired pedestrians to detect the presence of tactiles and follow their cues. i) Where the integrated TGSIs are of the same colour as the underlying surface – not less than 30% across its entire area. ii) Where discrete TGSIs – not less than 45%. 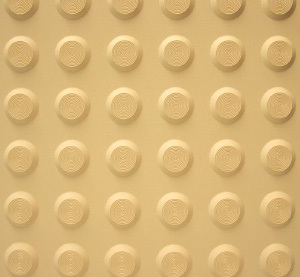 iii) Where discrete TGSIs are constructed using two colours or materials, the raised surface shall have a section that has 60% luminance contrast for a diameter of 24mm to 25mm…. What Colours do DTAC Tactiles come in? Urethane: Black, yellow, ivory, light grey. Blacktop: A black urethane centre with a stainless steel surround. What are the Slip Resistance Ratings of DTAC Tactiles? What Options are Available for Installation into Carpet Finishes? 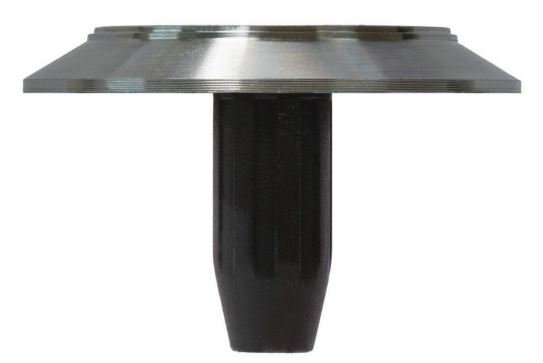 Install DTAC Metal plate to the subfloor and screw fit Tactile DT0116 into the threaded metal fixing plate. Hole punching of carpet may be necessary. Up to 6mm thick can be fitted through the surface using DTAC ECOtac DT0130. Why is Quality so Important When Choosing a Tactile Product? 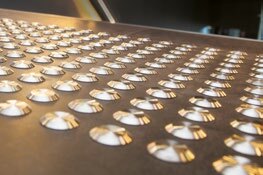 To remain compliant, tactiles need be able to withstand harsh conditions. Poor quality products that degrade quickly under the stress of constant foot traffic and harsh weather conditions, will lose their appearance and effectiveness. DTAC tactiles are designed and manufactured to withstand the harsh Australian conditions. Our products are extremely hard wearing and UV resistant meaning they offer a very long service life. Is DTAC on NATSPEC (the National Building Specification)? Yes, DTAC is the only tactile company on NATSPEC.